Ships today if you order in the next 9 hours 43 minutes. Is your hair feeling frazzled and vulnerable? Get your locks feeling confident, cared-for and oh-so chic again with 2 Chic Ultra-Moist Dual Action Protective Spray from Giovanni. Featuring Eco Chic Technology, this dual-purpose spray is designed to protect and nourish, protecting hair from heat-styling and nourishing it with moisturizing oils. 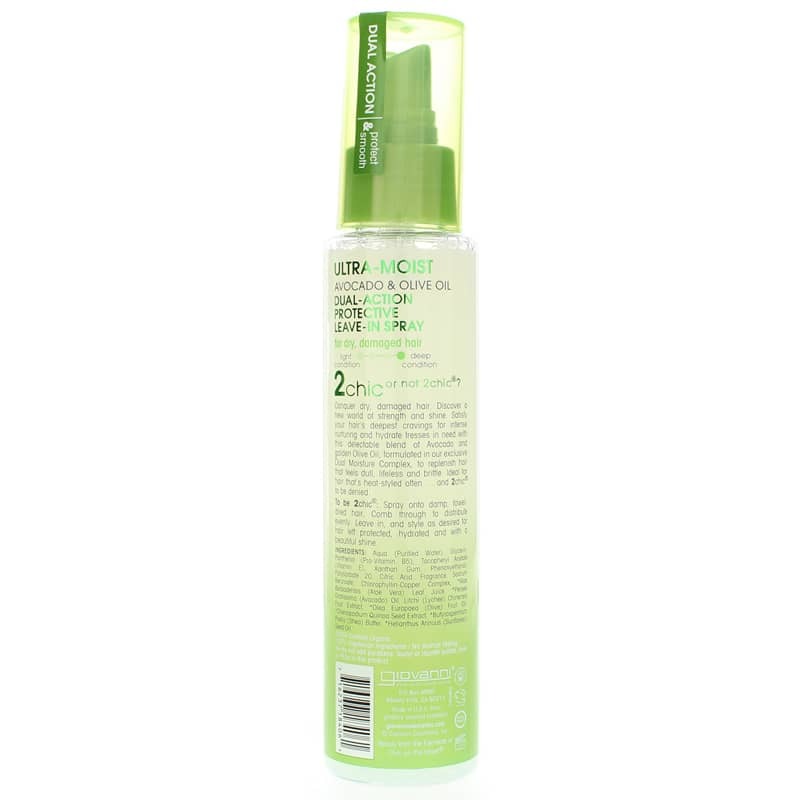 The ultimate protective pal for hair that's dry, damaged and desperate for some extra TLC, 2 Chic Ultra-Moist Dual Action Protective Spray is made with nourishing olive and avocado oils, plus aloe, Shea butter and other natural nourishers. Spritz it and leave it to naturally support hair's shine and bounce, and protect it during heat-styling while providing control for no frizz or fly-aways. Mist on some moisturizing protection for hair that's sleek and chic! 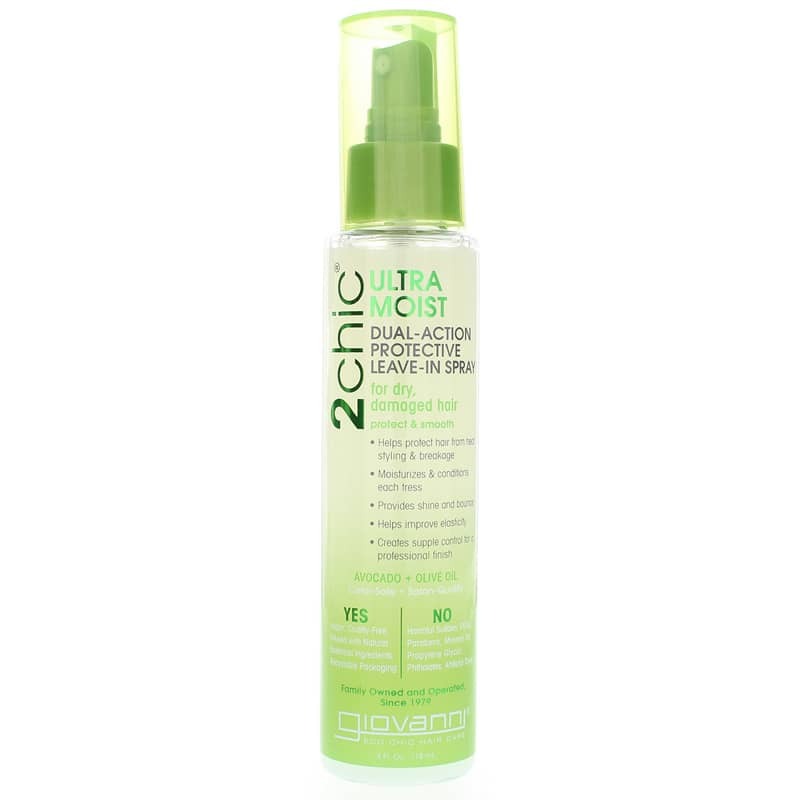 Order 2 Chic Ultra-Moist Dual Action Protective Spray today. Aqua (Purified Water), Panthenol (Pro-Vitamin B5), Glycerin, Tocopheryl Acetate (Vitamin E), Xanthan Gum, Phenoxyethanol, Polysorbate 20, Citric Acid, Fragrance, Sodium Benzoate, Chlorophyllin-Copper Complex, *Aloe Barbadensis (Aloe Vera) Leaf Juice, *Persia Gratissma (Avocado) Oil, *Litchi (Lychee) Chinensis Fruit Extract, *Olea Europaea (Olive) Fruit Oil, Cherpodium Quinoa Flower/Leaf Extract, *Butyrospermum Parkii (Shea) Butter, *Helianthus Annuus (Sunflower) Seed Oil. 100% Vegetarian Ingredients. NO animal testing. NO parabens or lauryl sulfate added to this product. This product gives a light moisture to your hair that is not heavy or oily. However, I was out of face moisturizer when I was in the mountains of Colorado and used it on my face. I'm hooked! I still use it on my face back here in Oklahoma. It's not oily or greasy or heavy. It doesn't clog my pores and I wear it under my makeup, it's great stuff!